Jamaica's national fruit is poisonous and resembles scrambled eggs. 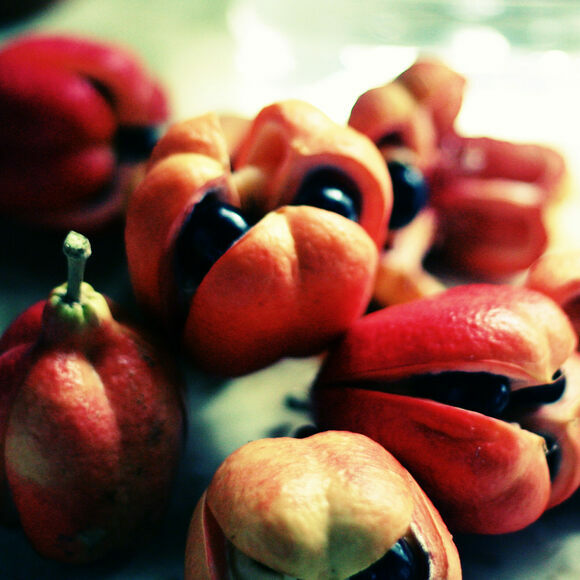 The ackee fruit, a poisonous relative of the lychee, tastes like scrambled eggs when cooked. The oddly savory fruit is only really enjoyed in Jamaica, where slavers brought the fruit in the the 1770s. While ackee’s introduction to other regions (including Caribbean nations, parts of Central America, and even Florida) garnered little interest or commercial success, the fruit comprises one half of Jamaica’s national dish, ackee and saltfish. Jamaicans grow ackee in two main varieties: the yellow-tinged, soft “butter ackee” and the cream-colored, hard “cheese ackee.” Both types turn increasingly yellow when exposed to heat and have a mild taste sometimes likened to heart of palm. Cooks prepare ackee and saltfish by first dicing and boiling the fruit. After frying it with tomatoes, onions, peppers, and spices, they add saltfish (rehydrated salt cod) and serve dumplings, breadfruit, hard dough bread, or green bananas on the side. There’s a reason ackee is usually cooked. It contains hypoglycin A, a poison that, according to the FDA, can cause “vomiting with profound hypoglycemia, drowsiness, muscular exhaustion, prostration, and possibly coma and death.” While the entire fruit is hazardous to eat when unripe, once the pods turn red and split open, the fleshy part of the fruit becomes edible. The ackee’s seeds and rind still retain toxic levels of hypoglycin A, though, which explains why exporting fresh ackee often proves difficult. While canned ackee is available year-round, finding it at restaurants out of season is difficult. But seeing as Jamaicans wait for fresh ackee rather than serve saltfish with the canned stuff, the risk is likely worth the reward. Jamaica exports canned ackee around the world, but you're unlikely to find it fresh unless you're on the island. In Jamaica, ackee and saltfish graces restaurant menus all year, but it's primarily served during the fruit-bearing season (from January to March and June to August).